PALM BEACH COUNTY, Fla. — Palm Beach County deputies say an 88-year-old man riding a motorized scooter was hit and killed Sunday. The Palm Beach County Sheriff's Office said the wreck happened around 10:45 a.m. at the intersection of Okeechobee Blvd. and Meridian Rd. 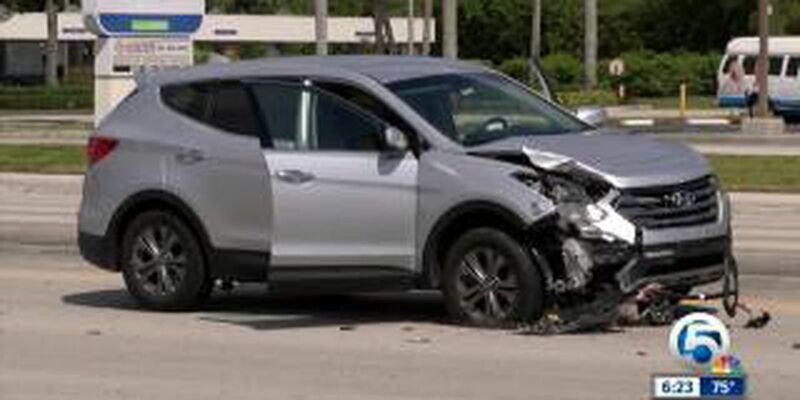 Deputies said a Hyundai Santa Fe, driven by 50-year-old Felicia Renee Martin, was traveling eastbound on Okeechobee Blvd. and entered the intersection on a green light. 88-year-old Albert Bender, riding a motorized scooter, disregarded a pedestrian crosswalk signal and entered the path of Martin's Santa Fe. The SUV struck Bender, ejecting him from his scooter.